Picture this: A little boy is at the ocean. He’s standing at the edge of the water with his Daddy when a wave comes in. The boy screams and runs away trying not to let the wave catch him. As the wave recedes, he runs forward giggling. This is my older son, Owen, who is unaffected by CMD. Now picture a little boy who can’t walk without help. What does his day at the beach look like? I’m not sure what image was in your mind, but I had trouble coming up with anything when I thought about our upcoming vacation. I wanted both boys to enjoy the summer, and to me, that meant running through sprinklers, playing in the pool and enjoying the beach. I just didn’t quite know how that would happen. I was taking our younger son, John, to swim therapy when I saw a man in a wheelchair made out of PVC pipe. I hadn’t ever seen a wheelchair like that before, but it gave me an idea. Fortunately I have a husband who encourages me to play and experiment when I get ideas. We took a trip to Home Depot and I rooted around the PVC pipe section looking for parts to make a walker. I found a condensate trap, which made perfect handles, plus the pipe itself and connector pieces. It took longer to find wheels, which I managed to scavenge after taking apart a toy lawnmower. I was so excited to try out the new walker. We filled a baby pool in our backyard. Owen was jumping and splashing all around, my husband ready with the camera. I put the walker into the water… and it floated! We all laughed, but it was an easy fix. I went back to the garage and drilled holes into the pipe. Second attempt… worked perfectly. 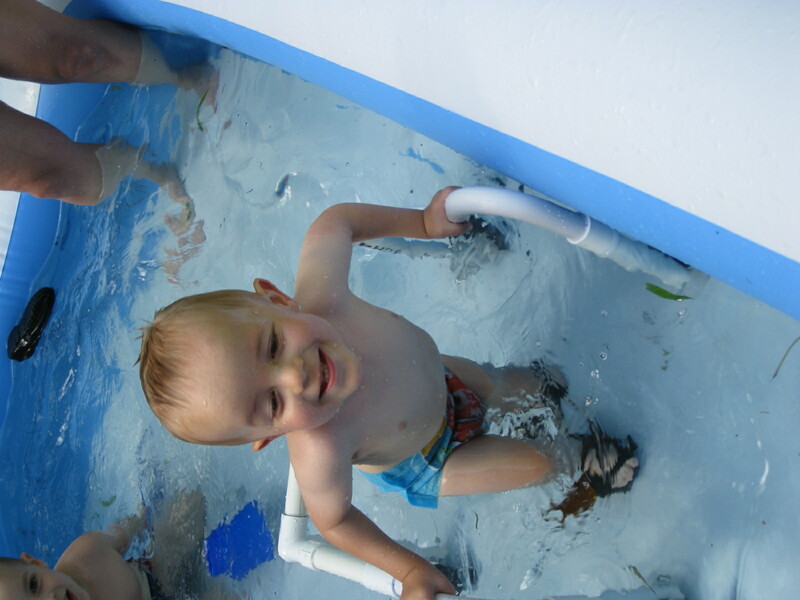 John was able to walk and play (and sing loudly) in the pool with his brother. At the beach the walker worked fairly well. John was able to walk himself. It was easier on the hard-packed sand, but he could walk on the soft sand as well. Although he wasn’t able to chase the water, he could stand by himself as the water lapped up to his feet. One thing I didn’t anticipate was that by the end of the week, the wheels of the walker had filled up with sand. All in all, though, because it gave John some independence, it was a success. But that was only the beginning. The walker has turned out to be an indispensable tool for our family. Picture this: A mom is taking her two children to swim therapy. I’ve got a bag with the bathing suits and towels in one hand. I’ve got my purse in the other hand. It’s raining outside. It’s a little too dangerous at this point to let John walk through a parking lot, so I’ve got to carry him. I have to hold Owen’s hand… and I have to haul a very heavy walker. How many hands does that add up to? More than I’ve got. With the PVC walker, I can either fling it over my shoulder, or I can hang it from the stroller. An impossible task became much more doable. There have been several other benefits, too. The PVC walker has been so much easier to use inside the house. It is much smaller and lighter than the ‘real’ walker we have, which is a spiffy, bright yellow with cool curves, and stable, but very expensive. While using it, John kept bumping into the sides of doorways and had to make 5-point turns to get through. He was also easily trapped by our own furniture. When the wheel of the walker would inevitably get stuck on a chair, he’d have to call for us to help him. But John can maneuver the PVC walker through doorways and throughout the house. Another fabulous unforeseen benefit is that John can go up and down small curbs and walk on uneven ground. The walker is so light he can lift it himself up to the curb and then pull himself up. When John needs to go up a set of stairs we tell him to hold on to the walker. We lift him up while he carries the walker, then set him down and he’s off and walking. It’s turned out to be kind of fun. This walker has made a tremendous difference in the quality of our life. I’m hopeful that it may be helpful to other families, too. There are a couple options. I’ve included a video that shows how to build a walker for yourself. Or, if you’d rather, email me at jennifermadeit@gmail.com and I can build one for you.